Provincetown: Cape Cod’s Most Popular Vacation Destination! - Provincetown Chamber of Commerce, Inc.
Provincetown: Cape Cod’s Most Popular Vacation Destination! 2020 the World will commemorate the 400th anniversary of this historic event. After two months crossing the stormy Atlantic none of the passengers or crew was allowed to come ashore in Provincetown harbor until the Mayflower Compact was signed by both laymen and the Pilgrims which bound them together under the rule of law ‘for the sake of order and survival.’ The Mayflower Compact is considered the foundation of the American Constitution. After five weeks of searching for place to settle on the Outer Cape, they decided to make their settlement across Cape Cod Bay in Plymouth. For more information please visit Provincetown400.com. Leave your “mark” in historic Provincetown! Purchase a Paver on the foot of MacMillan Pier! Over the past 30 years we have sustained the building with minor repair work, but today our 106 year old Chamber Building is in need of some significant work. We feel that our “Lady” should have a complete “Facelift” rather than just nips and tucks. Please consider purchasing a paver with your name, business name, or as a dedication in honor of someone special or in memory of a loved one. Your paver will be viewed by thousands of visitors for years to come! Click here for more information about our Paver Project. 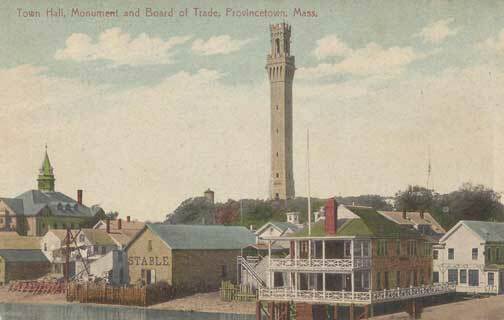 1918 Old postcard with Town Hall, Pilgrim Monument and Board of Trade building, now Chamber. Provincetown is quietly spectacular in the Spring, Fall and Winter months… a place to relax, reflect, meet interesting people and enjoy the moment… It’s easy to get here whether you drive yourself, take the bus, or fly in from Boston… Free parking in the Winter throughout town. Come, watch with us amazing sunsets! Check our WINTER GUIDE for places to stay and eat, to pamper yourself and your dog, things to do and much more! WINTER VISITOR GUIDE: Lodging, Restaurants, Things To Do and Pamper Yourself and Your Pet! Once one of the most productive whaling and fishing ports on the East Coast, today it is homeport to the whale watching fleet and closest to Stellwagan National Marine Sanctuary. MacMillan Pier is full of fishing charters, sailing, motor boats… Ferries from Boston and Plymouth bring thousands of visitors to Provincetown. Almost three-quarters of Provincetown is preserved in its wilderness state as part of the Cape Cod National Seashore Park. The Park provides visitors access to magnificent ocean beaches, nature bike and walking trails and exhibits… It is also great place for bird watching! Provincetown is the Oldest Art Colony in America! Celebrate the Arts in Provincetown. Many Artists come to Provincetown and are inspired by the sea, sand dunes, street scenes and of course the magnificent light and colors… Come and visit the many PROVINCETOWN galleries and studios and don’t miss visiting Provincetown Art Association and Museum! Provincetown is America’s pre-eminent destination for gay and lesbian visitors and residents, proud of its long heritage of a fully open and integrated way of life. Carnival week in August is one of Provincetown’s biggest events. Come join the Parade! Easy to Get to, Easy to Walk, Easy to Be Here! Provincetown is a regional public transportation hub with fast ferry, bus and air service from Boston and frequent local shuttle, it is also first and foremost a walking town. Stroll Commercial Street and marvel at our beautiful gardens and houses… Some are guest houses, some host unique shops and restaurants… Truly, a great place to fall in love and get married! The Provincetown Chamber of Commerce is always ready to welcome you. Please explore our site and use it as a gateway to one of the most unique vacation destinations in America! Fall in Love with Provincetown! Watch! We're here! Stop by for a visit! Visit our Welcome Center at the Provincetown Chamber of Commerce, 307 Commercial Street. You’ll find friendly people, visitor information and wheelchairs and canes that can be borrowed.